Chris Wood flew out to New Zealand from Heathrow last night but not before he’d made his first Premier League appearance for Burnley and scored the stoppage time equaliser to win us a point in a 1-1 draw at Wembley against Tottenham Hotspur. He came on just before the hour, got caught offside a few times, had a couple of opportunities, was then denied by the alert Hugo Lloris before firing home after running on to a sublime through ball from Robbie Brady to open his Burnley account and send one corner of our national stadium into raptures. As the Burnley fans celebrated, one supporter’s wallet flew past me (I kindly retrieved it for him) whilst two others, who were sat to my left, disappeared not to be seen again. It felt as though we’d secured a big victory, given the magnitude of this result, although we all did manage to calm down to watch the remaining couple of minutes until referee Lee Mason finally brought it all to an end. We’ve certainly had some travelling to do for the away games either side of the close season. Last season ended with trips to Crystal Palace and Bournemouth while we’ve kicked off this season with two London visits to Chelsea and to Spurs. It was nothing to do with superstitions, I can assure you, but yesterday, having won two weeks ago at Chelsea, we travelled by the same route, we made the same stop on the journey, parked at the same underground station and even went in the same cafe for a sandwich close to where we’d parked before using London Underground to get to the game. There were some differences. It was hot on the day of the Chelsea game but yesterday it was stifling. We were all but ignored by any passing Chelsea fans ahead of the game two weeks ago, although they were congratulatory afterwards, but yesterday the Spurs fans were only too keen to engage and I was sort of in my element when I was able to chat to one Spurs fan of similar age about such as Jimmy Greaves, John Connelly, Cliff Jones and Jimmy McIlroy. I certainly had that 1962 FA Cup Final in my thoughts as I walked towards the stadium, the same walk I’d made with my dad in May 1962 for a game between the same two teams. It will be 28 years ago tomorrow since he passed away but I’m sure he’d have been thrilled to have seen a repeat of that game at the same(ish) venue with the Clarets this time not losing. 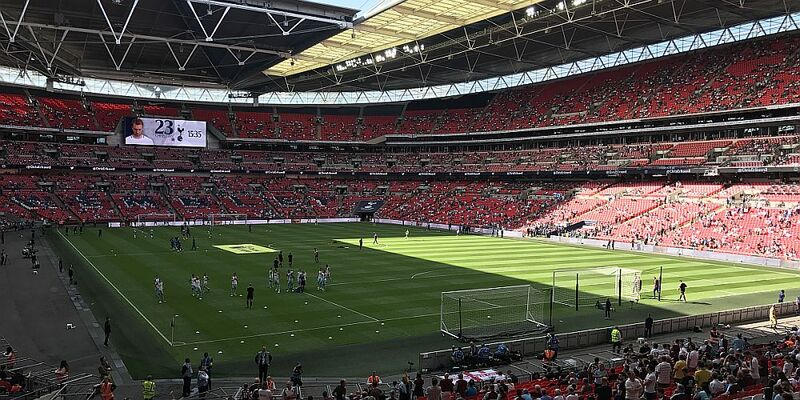 I’m sure players will tell you that it is a dream to be given the opportunity to play at Wembley so it must have been a big disappointment to Jeff Hendrick and Jon Walters who both missed out with injury. At least both can boast of having played at Wembley; Hendrick was in the Derby team who lost the 2014 play-off final against QPR while Walters played their twice in the FA Cup of 2010/11, scoring twice in the 5-0 win against Bolton in the semi-final, a game that really did accelerate Bolton’s decline. Sean Dyche always says it’s an opportunity for someone else and so Scott Arfield, who can also claim to have played at Wembley when he was used as a late substitute by Huddersfield in their 2012 League One play-off win against Sheffield United, was given Hendrick’s place in the starting eleven. We started quite brightly and it was Lloris who had to make the first save of the game from Robbie Brady although perhaps his right foot curler from the left was an over hit cross. James Tarkowski then headed over but the pattern of the first half was soon set with Spurs looking the more likely as they took the game to us. For long periods of the half it looked as though we were just about keeping ourselves level although, to be fair, I can’t really recall Tom Heaton having too much to do in terms of making saves. We defended well when we had to and protected the captain well. They did have a couple of good opportunities, one failed to hit the target while Tarkowski got in a good block with the other. And so to half time with things level and I felt we should be certainly happy with the scoreline and reasonably so with the performance given we’d not allowed our opponents too much in the way of chances. Unfortunately, things changed early in the second half when Kieran Trippier, who had received a warm reception from the Burnley fans ahead of the game, won a corner on the right. The corner was flicked on, Ben Mee couldn’t get enough on it and the ball fell to Dele Alli. His first effort was blocked by Matt Lowton but he made no mistake with his second opportunity and with only four minutes of the second half gone we found ourselves behind. Kane was close to doubling the lead soon after; his shot went wide but we were having a difficult spell and just before the hour we made our changes with Wood and Ashley Barnes coming on for Johann Berg Gudmundsson and Sam Vokes bringing a switch to our more familiar 4-4-2 system. Things improved for a while and again Lloris did well to keep out a Brady right footer, but this one was a really good effort from the wide man who was now on the right hand side of the pitch from where he was to make a telling contribution. With less than twenty minutes remaining, and with the score still 1-0, Spurs really pushed on to try and win it. We held on. At times it was frantic and more than once we were reliant on Heaton who made more good saves, on in particular from Kane was an outstanding stop down by the foot of his right hand post. We saw it off, and then went for it ourselves and, although not quite understanding it at the time, I think replacing Steven Defour with Ashley Westwood was the catalyst. Westwood made a telling contribution while out on the right, Brady twice played superb through balls. The first almost set up Barnes and the second saw Lloris come out brilliantly to deny Wood. On the left hand side, Stephen Ward was getting plenty of space. He was causing them a lot of problems with some very good balls into the box; now we were the team on top. Spurs had hung on as Bobby Madley held up the board for four extra minutes but they didn’t for much longer. The moment came when Heaton cleared the ball for Wood to head down for Barnes around half way. Barnes played the ball to the right for Brady and his next through ball was better than the rest. Sublime it most certainly was and this time Wood had made a good run forward and was there to take the chance really well despite the attentions of Toby Alderweireld. It’s not a bad place to score your first goal for your new club is it? Embed from Getty ImagesWe’d hoped when that board went up for four minutes there had been a few more; now we were wishing it had been less, but as the Burnley fans roared on the team there was to be no comeback from Spurs and we played out the remaining couple of minutes with ease. It felt like a win, it really did. Burnley fans were celebrating in the stand, on the concourse, outside and then down Olympic Way to the underground station. We’d all got sick of hearing how Spurs can’t win at Wembley and how Harry Kane can’t score goals in August. There was always this thought that they might end both those against us. They didn’t, so the ‘can’t win at Wembley’ they can take on. As for Kane, that one can be forgotten about now for eleven months. When the fixtures came out I suggested that any points from the first five away games would be a bonus, certainly given last season’s return. Well, that’s four points from the first two and what two fantastic days out they’ve been. What a joy it is watching this Burnley team right now and maybe we could have done without this international break. But that’s what we’ve got with the next game against Crystal Palace a week on Sunday. Just the last few days of the transfer window to enjoy or endure now. Will we add to our squad? That I don’t know but if we don’t, we know we’ve got a damn good squad of players taking us through to the next window in January. It’s not been a bad week has it? A win at Blackburn and a point at Wembley. Tottenham: Hugo Lloris, Kieran Trippier, Toby Alderweireld, Jan Vertonghen, Ben Davies, Eric Dier, Mousa Dembélé (Davinson Sanchez 90+2), Christian Eriksen (Harry Winks 88), Dele Alli, Son Heung-min (Moussa Sissoko 70), Harry Kane. Subs not used: Michel Vorm, Kyle Walker-Peters, Tashan Oakley-Boothe, Vincent Janssen. Burnley: Tom Heaton, Matt Lowton, James Tarkowski, Ben Mee, Stephen Ward, Johann Berg Gudmundsson (Chris Wood 57), Scott Arfield, Jack Cork, Steven Defour (Ashley Westwood 81), Robbie Brady, Sam Vokes (Ashley Barnes 57). Subs not used: Nick Pope, Phil Bardsley, Kevin Long, Charlie Taylor.